Just last year during the Paris Motor Show, Mercedes Benz officially launched their “EQ” sub-brand. The Brand will be dedicated to all-electric vehicles. The first car they showcased was a unique crossover CUV concept. 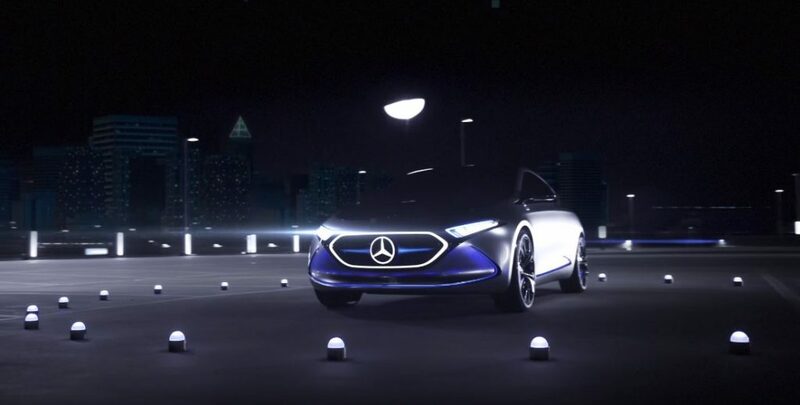 Fast forward to this year and Mercedes Benz has just showed off the all new “Concept EQA.” Mercedes-Benz’s Concept EQA is a compact, four-wheel-drive hatchback. Mercedes seems to be aiming to push the Concept EQA into direct competition with the Tesla Model 3. And it will be a fierce competition. Both the Model 3 and the EQA are similar in size, vehicle class and performance. For the time being the EQA is a concept car. However, Mercedes-Benz representatives expect to roll something remarkably similar to the EQA off their factory lots within the next few years. Details are scarce but we do know a few things about the Concept EQA. For one thing, the drivetrain utilizes dual electric motors located at the front and rear of the car. This is was totals the full 268 horsepower with 368 lb-ft of torque. A Duel electric motor setup in fact opens the door for full on variable torque vectoring between the two axles. There will be unique torque splits offered exclusively in the proposed in Sport and Sport+ modes of the car. If you open up the EQA you’ll find that its heart is a 60 kWh battery pack located beneath the car’s floor. Mercedes representatives told the press that the Concept EQA could potentially have a range of about 250 miles on a full charge. However, European and US EV testing calculations are a little different from one another. It should be noted that Mercedes is also very keen to push a new “fast-charging” system. It will add about 62-miles of range after a 10 minute charge. How does the EQA Perform? We’ve seen a few videos about the EQA as well as test drives. In testing, the unique electric powertrain design allows the Concept EQA to go from 0-60 mph in about 5.0 seconds. Meanwhile the Tesla Model 3 can go from 0-60 acceleration in between 5.1 and 5.6 seconds. The Model 3s performance is dependent on the trim the car owner uses. However, should the EQA go to production, it will by default be better equipped than the lowest-tiered Model 3. Few concept cars ever make it to full production. However, if Mercedes Benz is serious about their push for more EVs and competing with Tesla, the EQA may be their ace. Check back with us, as we’ll have more on this development soon!